Batik textiles are ubiquitous in the rich Indonesian/Malay visual culture. The stunning and intricate designs obtained through the resist dyeing technique are appreciated all over the world, and a source of inspiration for international fashion and textile designers. 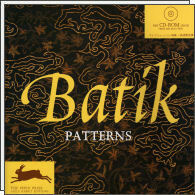 Batik Patterns contains some 100 illustrations of masterpieces produced in the late 19th and early 20th centuries.